The Westin Dubai Mina Seyahi Beach Resort & Marina is one of the most stunning beachfront hotels in the dazzling Dubai. It is strategically located on the Jumeirah Beach to guarantee a perfect beach vacation for families and couples alike. Better still, you can lounge on the private 1,200-metre-long beach and bask in the warm sunshine. Accommodation in this 5-star beach resort is world class, well equipped with contemporary amenities. The rooms are tastefully decorated and affords wonderful sea views. The 9 on-site restaurants and bars serve a wide array of international cuisines, beverages and an award-winning brunch. You can rejuvenate yourselves at the spa in the hotel or make a splash at one of the 5 swimming pools. A tennis court, a fitness centre, kids’ club and a water sports centre round out entertainment and recreation at the Westin Dubai Mina Seyahi. The hotel also shares facilities with Le Meridien Mina Seyahi. The Westin Dubai Mina Seyahi Beach Resort & Marina is located just 500 metres away from the Jumeirah coastline. It is 23 km away from the Maktoum International Airport. Also, the Dubai International Airport is just 27 km away. The hotel is strategically located in the vicinity of several malls and shopping complexes. The Marina Mall is just 1.9 km away while the Burj Khalifa is 17 km away. the Dubai tram station is 200 metres away. 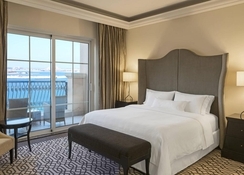 Broadly categorised into rooms and suites, the accommodation facilities at Westin Dubai Mina Seyahi Beach Resort & Marina oozes pure luxury and comfort. The decor is a mix of classical and contemporary styling. The rooms come with city view and sea view. Contemporary amenities like Wi-Fi, a Nespresso machine, safe, telephone and flat screen TVs are common features of the rooms. 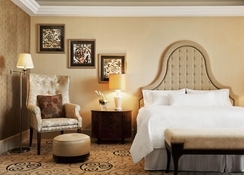 The rooms also boast of en-suite marble bathrooms featuring grand mirrors and high ceilings. The 9 on-site restaurants and bars at the Westin Dubai Mina Seyahai Beach Resort & Marina serve a wide range of Arabic and other international cuisines, as well as a long list of drinks. Among the other cuisines that you can sample are Italian at Bussola, Thai at Spice Emporium, Asian at China Grill, Spanish at El Sur and international at Blue Orange. The Hunters Room & Grill is a great spot for trying succulent steaks. Guests can also opt for the Bubbalicious Friday Brunch. Sip on refreshing drinks and beverages at the Oeno Wine Bar, Sand Bar, The Atrium, Industrial Venue and the pool bars. 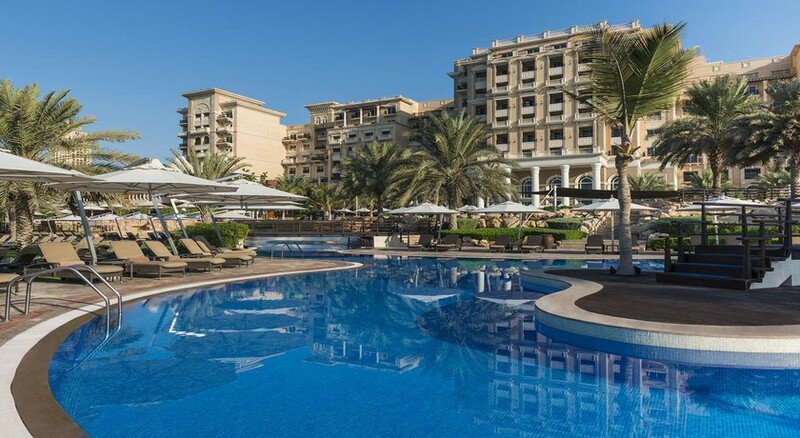 At the Westin Dubai Mina Seyahi Beach Resort & Marina, 5 resort pools and a 1,2oo-metre private beach ensures that the guests get a full dose of splash-tastic fun. The hotel also boasts of its Heavenly Spa where you can choose from a long list of spa and beauty treatments. For sports enthusiasts, there is a tennis court and a fitness centre supervised by experienced trainers. Young guests can play beach games or enjoy at the paddle pool, kids’ club and the Wadi water park. The hotel also features a water sports centre offering range of activities including water skiing, windsurfing, wakeboarding and kayaking. If you’re a keen golfer, tee off at the nearby golf courses. The hotel offers its guests shared facilities with Le Meridien Mina Seyahi. Two children under the age of 12 years can stay free of charge. The maximum number of extra beds permitted is one.